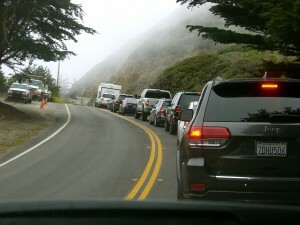 There is a certain tension that comes with driving on a road carved into the edge of a steep, rocky mountain. 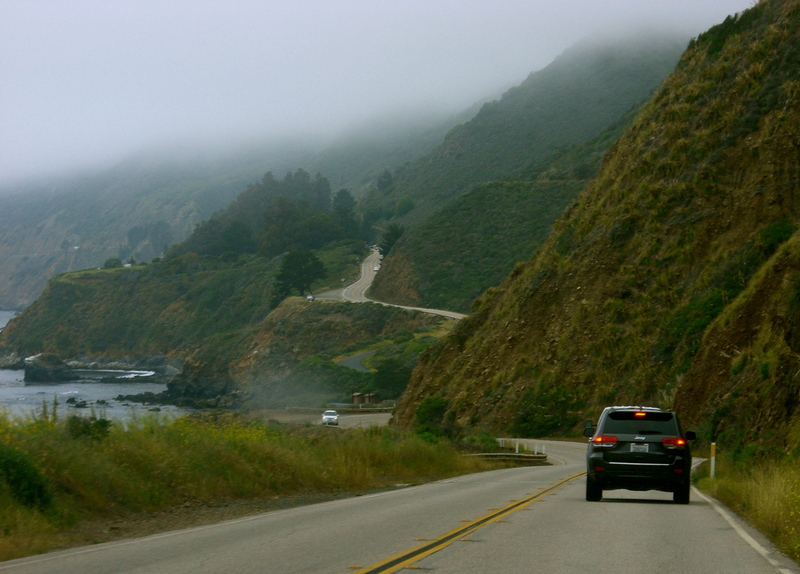 Add to it a lack of guardrails in several places – not that they would do much to stop you – and the threat of a plunge hundreds of feet into the sea, and driving Hwy 1 through Big Sur fails to delight. We had mist through most of it, negating any view, and I was sort of grateful. No need to see exactly how close death is, separated from us only by a little berm of gravel along the edge of a road being repaired. Stopped for road construction. I was grateful that the mist hid the view over the edge of the road. Gah. A brief stretch of less stressful driving. We both heaved a sigh of relief when we were through it, and zipped past Carmel and Monterey, as we’ve spent time there before. We pulled off at Moss Landing for a Mexican restaurant I’d read about online, the Haute Enchilada. Lovely. A good place to sit and take the edge off. 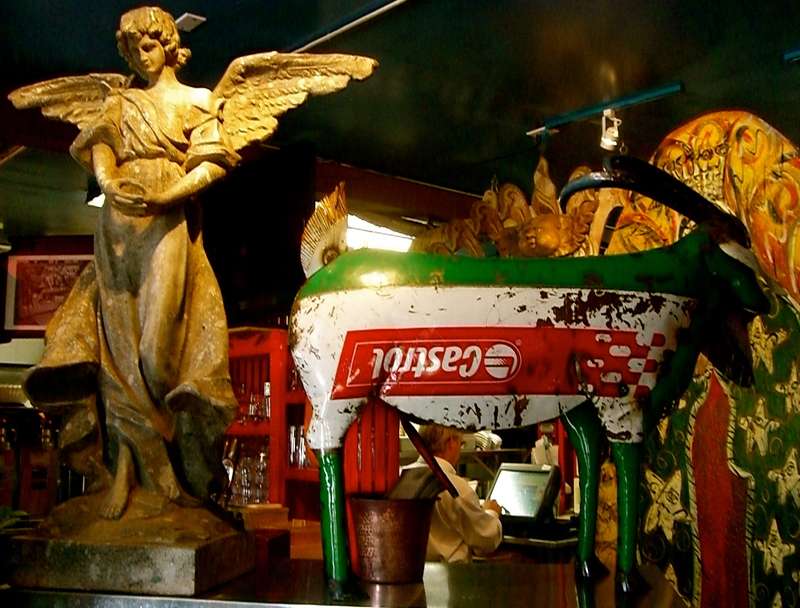 Plus, they had a petroliana, folk art goat as part of the decoration. Clark would have bought it if it had been for sale. Castrol goat, anatomically correct. Or if not correct, at least ambitious. 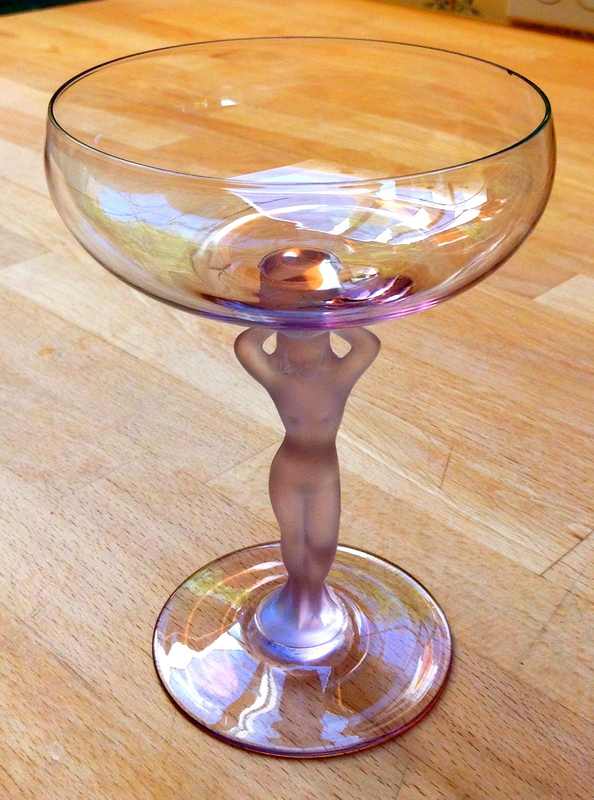 Across the street we found a small antique shop, where I made my only purchase of anything (besides food) for the entire trip: a champagne coupe in lavender glass, with a naked woman as the stem. $7, and my only souvenir. Getting back onto Hwy 1 was a bit of a bear, as it was Friday and we were seeing the beginning of Memorial Day Weekend traffic…. Or maybe it’s always like that. I don’t know. I just know that making a left turn onto the highway took several minutes and a little bit of cursing. 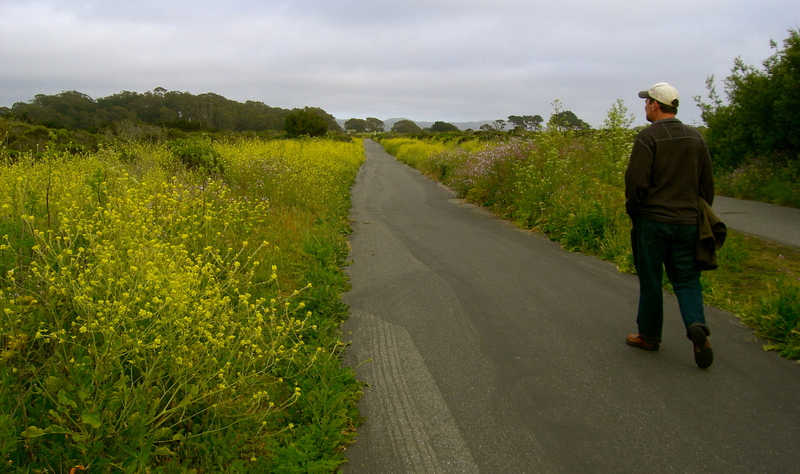 We didn’t stop again until Half Moon Bay, for groceries for another picnic dinner. I got a kale Caesar from the deli of a Whole Foods-like grocery store, which was a mistake. It tasted nothing like a Caesar salad, and I wonder if it was vegan and without, say, the egg, anchovy, and parmesan one needs to have a Caesar. And the kale hadn’t broken down at all in the dressing. God knows how my gut microbes are dealing with it. Good luck, little guys! I did it for you. 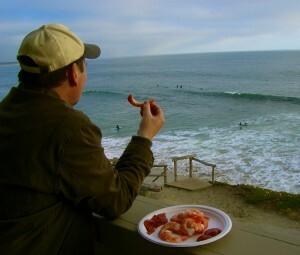 Our hotel is nice enough, and the surf crashes about 25 yards away, on the beach below a 15’ dirt cliff. It’s gloriously loud. We took a walk along the coastal pathway that starts right beside our hotel, spotting rabbits this time instead of ground squirrels, then came back to the hotel for dinner on the balcony and the entertainment of once again watching both surfers and porpoise-y creatures. I finally got around to checking my email, and there was a short one from Kirk about my Scrumpy pitch, saying, “No news on this end…but that’s not a bad sign. I followed up with Lucas, who still swears he liked it.” If (if if if) Lucas’s higher-ups want to hear more, the next step would be calling me back for a re-pitch. Kirk also sent photographic proof that he had put our gift of Beachbum Berry Remixed to good use, and made the Trader Vic’s Mai Tai that is, in our opinion, the very best recipe in the book. I read online that there was supposed to be a possibly fantastic meteor shower called the Camelopardalid (I think it means “giraffe”), with high activity between 2-4:00 AM. We woke up by chance at 3:30 and went to look, and by some miracle there was a clearing in the mist and clouds and we had a starry sky. But no meteors. Boo. Our room faces SSW, which wasn’t optimum, either – N was supposed to be the prime direction. Oh well. 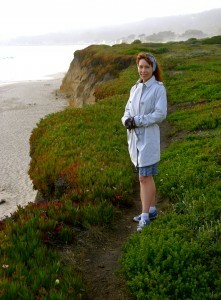 I also read online that a dead gray whale was bobbing around near Pillar Point, at the north end of Half Moon Bay. Perhaps we’ll go look for it when heading out of town tomorrow. Here’s hoping that if we don’t get sky-streaking giraffes, at least we get a bloated whale.